Although I missed this particular boat last Thursday, it seems that files for the upcoming Windows 8.1 Update (apparently to be called the Spring 2014 Update) appeared online by mistake that day. For a while, editing a Registry key was all it took to gain access to the upcoming new bits for Windows 8.1. While MS has now blocked that form of access, I just tried the links to update files via Knowledge Base (KB) downloads, and was able to access two of them without difficulty while the other four produced 404 errors. 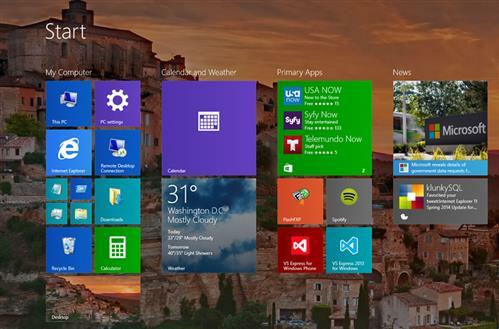 Snapshot of a typical Win 8.1 Update 1 Start screen (source: WinBeta.org). You can find a complete list of these links at Microsoft-News.com in a story entitled “Windows 8.1 Update Leaks…Sort Of” (click the 32-bit or 64-bit elements in the middle of each list item to get to the corresponding KB items). The story goes onto opine that “…these links are intended for internal Microsoft employees [who] have been testing or “dogfooding” Windows 8.1 Update 1,” which may explain why some of those links still work. So far, published reactions to the new update have been mixed, with some individuals reporting bugs or an inability to start the OS after installation of some KB items, and others reporting no such problems. Neowin.net already has an interesting summary from those members of its user forums who’ve installed the update: it’s entitled “Neowin members offer impressions of Windows 8.1 Update 1.” If you’re interested in a preview of things to come, it’s probably too late to grab them from Microsoft, so you’ll have to ask yourself if curiosity trumps caution when it comes to seeking out the BitTorrent versions likely to proliferate soon, if not already available.